Andrea and I attended the Tennis Wales Awards Dinner at the Village Hotel, Ewloe near Mold in North Wales on the evening of Saturday 26th January 2019. We were there to represent the club at this event and we were privileged to be able to collect the award on behalf of our Men’s First Team for the Club Team of the Year. 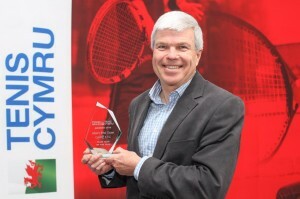 I was presented with the trophy by the new Tennis Wales Chief Exec Simon Johnson and before anyone says it, I know this will be the closest I ever get to playing for our first team! It was a lovely evening and of course made better by the club’s award. I was also pleased that the longstanding friend of our club Nigel Jones, was presented with a well deserved Lifetime Achievement Award for his services over 30 years to Welsh tennis. Please list using bullet points the nominee’s achievements between December 2017 and November 2018. 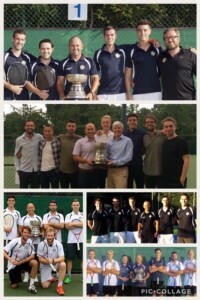 2, The same squad, newly promoted in 2017 to the National Division of Team Tennis retained their place in this division. Our second team, made up of other members of the SW Doubles first team squad won the South Wales Team Tennis Division 1 competition, demonstrating real strength in depth. 3, Individual members of the squad had individual successes in the Welsh Championship. Achievements in 2018: Using the points above please provide further and more extensive detail of the top 3 achievements. 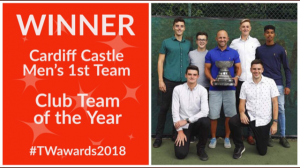 1, Under the stewardship and captaincy of Head Coach John Williams, the Mens South Wales Doubles League First Team were again unbeaten in the South Wales 2018 Summer Doubles League, winning 58 out of a possible 60 rubbers and earning maximum points. The team have now gone 7 years and 70 matches without being beaten. Most of the squad have been developed under John’s coaching from an early age and have a strong team bond and an all for one team ethic. 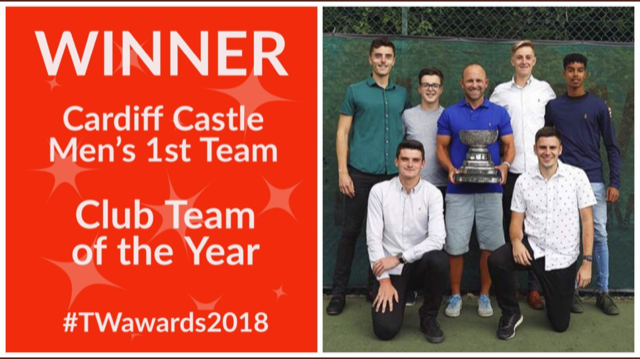 2, The same squad of players, under captain Dan Sidaway, have also performed very well in the National Division of Team Tennis and the more junior members of the first team squad in the South Wales Team Tennis competition. In the first year at the National Division level the team beat the very well established clubs of Edgbaston Priory and the Mackintosh Club of Cardiff. They competed well in every match and did more than enough to hold their own at this level. The more junior members of the squad, won the South Wales Team Tennis Division 1 and in the process beat all the best South Wales first teams. Throughout the season the squad demonstrated high team spirit, preparation and practice with great attitude and effort. There was no place for egos, they respect every team but feared no one. 3, Individual players that contributed to the above also had individual success. In the Welsh Championship, Danny Flynn won both the Men’s and 18′s Singles titles. 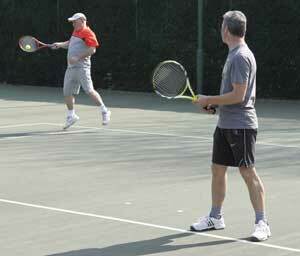 Frank Powell-Davies won the 16&U Boys Singles and Doubles and Frank and Dafydd James won the 18&U Boys Doubles. Tiarnan Brady and Danny Flynn also won the Men’s Doubles title. These young players reinforce the fact that the club is focusing on youth and ensuring the Men’s First Team is already thinking of the future and planning for even longer term success. Historical Information: In no more than 500 words please provide a brief historical background of the nominee prior to 2018. Cardiff Lawn Tennis Club was founded in 1888 and was originally known as “The Racquet Club”. It was originally situated in Westgate Street at what is now the Welsh Rugby Union souvenir shop. The tennis club moved to its present location in the grounds of Cardiff Castle in 1923 and in 1947 the Marquis of Bute handed the club a 999 lease ensuring the preservation of the tennis club. With a recently refurbished and modernised clubhouse, 11 floodlit courts, its picturesque yet central location and extensive car parking, it is easy to see why Cardiff Lawn Tennis Club is regarded as one of the finest tennis clubs in Wales and beyond. This is particularly true with its reputation as the club to beat in team tennis competitions in South Wales and beyond. Team tennis has produced and developed many outstanding players over the years and competitive tennis is embedded in the DNA of the club. We have routinely produced quality players through our youth programme and they have gone on to make our Men’s First Team the team to beat in Wales for many years. We are very proud of the fact that most of the current squad members for both the first and second teams come from home grown talent carrying the tradition on to the present day and hopefully the future too. We are immensely proud of the longstanding performance of our top teams and it is for this reason that we are again nominating our Men’s First Team as the Club team of the year for 2018.